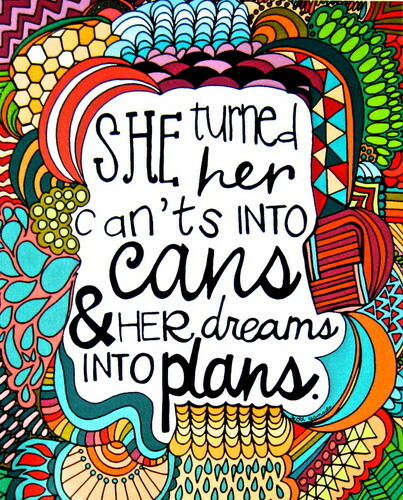 Yay for motivational slightly girly looking quotes! I thought a lot today about what I wanted my blog to be. I’m not a girly blogger or really interested in fashion, to be fair if I posted what I was wearing every day you would all get pretty bored I think…other than the awesome T-Shirts (oh Primark you are so good to me). I don’t know where exactly I fit in the blogging world after all this blog is a year and a half old now, so shouldn’t I know? I had today off and realised I wrote nothing yesterday, then panicked a little. So I went to town bought some new notebooks and a few books…opps. I wanted to feel like I was doing something rather than looking at my laptop. So I started thinking am I writing what you guys want to read? Will I ever get a huge following? Am I interesting at all?!? Let’s face it, we all want to know that what we’re writing is actually being read. Then I stopped myself, I blog for me mainly and I’m starting to figure out what you guys like too. You all love lists apparently, which is fine with me because I’m a little obsessed with them. So I decided I would write today, although I didn’t know what on. I wanted to write about Leelah Alcorn, something I am working on, but I need to find the right words which haven’t happened yet. I also told myself to stop freaking out because I missed one day. So I started googling things to make me think or just quotes I liked and I found this one, about doing things. It’s kind of what I’m doing step by step, take last night for example. Last night was the first night I had spent completely alone since halls last year and I was ok. I was a little lonely going to sleep because I like cuddles but I was pretty good. I read for a long time, got some cleaning done, saw my friend Joe. So instead of thinking I can’t stay in this flat alone I changed it to a can, and I’m bloody ecstatic about it. As for the dreams into plans thing, I’m working on that I’m focused on my future, my band, my well being and a project I’m working on. Basically I’m working on it. Note: This image was found online and I do not own the rights.